High seated, the pedicab driver called on passengers unloading from a bus at the San Carlos City terminal in Negros Occidental, motioning them to come near him. Some just walked past but I approached and after telling the driver to take me to the pier, I was off in a jiffy. 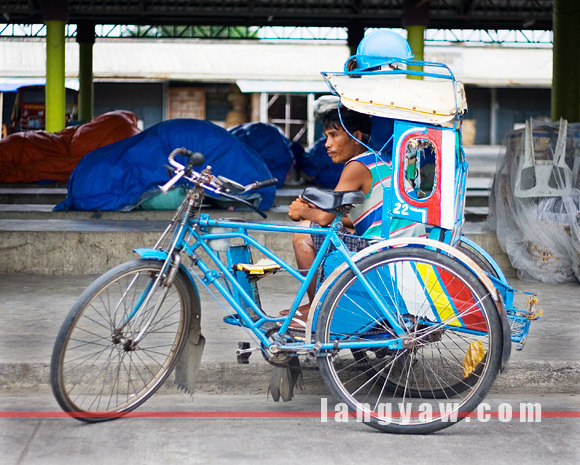 I’ve always been fascinated with these three wheeled vehicles plying the roads of cities and towns in the Philippines. Either motorized or manually driven, it comes in different forms and designs and are unique to the places they ply. I like riding in these pedicabs, in many parts of Visayas and Mindanao, these are called sikad or padyak, meaning to push with the feet. Manually powered vehicles that’s just great to ride on because of the unhurried nature and non polluting. But the ones in San Carlos City, like in Ozamiz, Leyte, Samar and Biliran (the last three provinces have smaller bikes), have almost the same designs. The bicycles are old fashioned and large, prompting the driver to be elevated, and how bicycles should be. While in Biliran they have foot brakes, here, its the usual handbrake system connected to the handle bars. A simple vehicle that is a joy to ride around the place.